Despite its compact size, the AW-UE70 integrated remote camera is able to deliver 4K images with excellent zoom range and exceptional pan-tilt performance. This camera includes a variety of advanced and intelligent features, like in-camera 4K recording or 4K streaming over IP. The professional video industry's first integrated 4K PTZ camera, the AW-UE70 is your key to best-in-class pan/tilt/zoom 4K IP streaming and in-camera 4K recording. It delivers 3840 x 2160 resolution images at 29.97p/25p via HDMI, and is capable of doing it via IP streaming or in-camera. Featuring key production orientated features such as genlock, Optical Image Stabilization (O.I.S) and remote switchable ND filters. 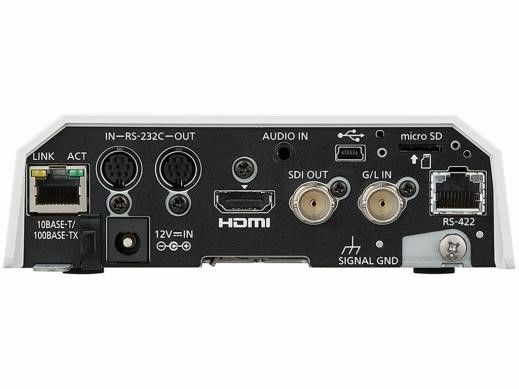 The AW-UE70 features a next-generation 1/2.3-type MOS sensor and DSP (Digital Signal Processor) for high sensitivity and high resolution up to UHD/30p. With the four-drive lens system, three zoom lenses and one focus lens are driven independently and simultaneously achieving a smaller body and a zoom mechanism with high magnification and high image quality. The AW-UE70W/K has a high-resolution 20x optical zoom and a high-performance iA 22x zoom (4K mode). Built-in optical image stabilization excels in vibration caused by wind, subwoofers/loudspeakers, ventilation systems, and more. The AW-UE70 is quite a step up from the AW-HE40 introducing broadcast/production oriented feature-sets including a motorized ND filter wheel for varied lighting environments, 3G SDI for up to 1080/59.94p output, external sync input (genlock), and more. Even for HD usage, a higher image quality is achieved with a higher quality lens system which has better focus tracking and evenness throughout the image. Serial Control: RS-422 serial compatibility is available for serial based control workflows (i.e. connection to AW-RP50/120 or previous controllers). RS-232 and RS-422 VISCA protocol is available when introducing a Panasonic camera into an existing control structure. USB or microSD Card Recording: The mini-USB connector allows the AW-UE70 to be utilized as a USB camera utilizing standard USB Video/Audio class drivers. Many applications that connect to USB cameras, such as teleconferencing or software switching solutions, will be able to connect to the UE70 without external converters. Alternatively, microSD recording enables ISO MP4/H.264 recording internally in the UE70, transfer of content over the network via web browser or FTP. Tripod Mount for Mobile Production: The UE70 is also equipped with a 1/4-20 tripod mounting screw receptacle and a safety lanyard for use with many mounting and grip systems.